Two years after the Fukushima disaster started unfolding on 11 March 2011, its impact on the global nuclear industry has become increasingly visible. Global electricity generation from nuclear plants dropped by a historic 7 percent in 2012, adding to the record drop of 4 percent in 2011. This World Nuclear Industry Status Report 2013 (WNISR) provides a global overview of the history, the current status and the trends of nuclear power programs worldwide. This report looks at nuclear reactor units in operation and under construction. Annex 1 provides 40 pages of detailed country-by-country information. A specific chapter assesses the situation in potential newcomer countries. For the second time, the report looks at the credit-rating performance of some of the major nuclear companies and utilities. A more detailed chapter on the development patterns of renewable energies versus nuclear power is also included. Annex 6 provides an overview table with key data on the world nuclear industry by country. The 2013 edition of the World Nuclear Industry Status Report also includes an update on nuclear economics as well as an overview of the status, on-site and off-site, of the challenges triggered by the Fukushima disaster. However, this report’s emphasis on recent post-Fukushima developments should not obscure an important fact: as previous editions (see www.WorldNuclearReport.org) detail, the world nuclear industry already faced daunting challenges long before Fukushima, just as the U.S. nuclear power industry had largely collapsed before the 1979 Three Mile Island accident. The nuclear promoters’ invention that a global nuclear renaissance was flourishing until 3/11 is equally false: Fukushima only added to already grave problems, starting with poor economics. Operation. There are 31 countries operating nuclear power plants in the world. A total of 427 reactors have a combined installed capacity of 364 GWe. These figures assume the final shutdown of the ten reactors at Fukushima-Daiichi and -Daini. It should be noted that as of 1 July 2013 only two (Ohi-3 and -4) of the 44 remaining Japanese reactors are operating and their future is highly uncertain. In fact, even if four utilities are expected to submit restart requests in July 2013, many observers believe that a large share of the suspended Japanese units will likely never restart. The nuclear industry is in decline: The 427 operating reactors are 17 lower than the peak in in 2002, while, the total installed capacity peaked in 2010 at 375 GWe before declining to the current level, which was last seen a decade ago. Annual nuclear electricity generation reached a maximum in 2006 at 2,660 TWh, then dropped to 2,346 TWh in 2012 (down 7 percent compared to 2011, down 12 percent from 2006). About three-quarters of this decline is due to the situation in Japan, but 16 other countries, including the top five nuclear generators, decreased their nuclear generation too. The nuclear share in the world’s power generation declined steadily from a historic peak of 17 percent in 1993 to about 10 percent in 2012. 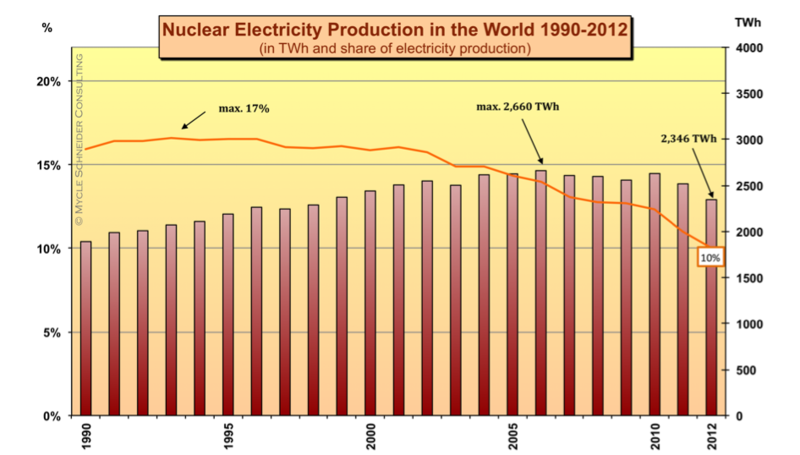 Nuclear power’s share of global commercial primary energy production plunged to 4.5 percent, a level last seen in 1984. Only one country, the Czech Republic, reached its record nuclear contribution to the electricity mix in 2012. Age. In the absence of major new-build programs, the unit-weighted average age of the world nuclear reactor fleet continues to increase and in mid-2013 stands at 28 years. Over 190 units (45 percent of total) have operated for 30 years of which 44 have run for 40 years or more. Construction. Fourteen countries currently are currently building nuclear power plants, one more than a year ago as the United Arab Emirates (UAE) started construction at Barrakah. The UAE is the first new country in 27 years to have started building a commercial nuclear power plant. • Nine reactors have been listed as “under construction” for more than 20 years and four additional reactors have been listed for 10 years or more. • Forty-five projects do not have an official planned start-up date on the International Atomic Energy Agency’s (IAEA) database. • At least 23 have encountered construction delays, most of them multi-year. For the remaining 43 reactor units, either construction began within the past five years or they have not yet reached projected start-up dates, making it difficult or impossible to assess whether they are on schedule or not. • Two-thirds (44) of the units under construction are located in three countries: China, India and Russia. The average construction time of the 34 units that started up in the world between 2003 and July 2013 was 9.4 years. • Startups and Shutdowns. Only three reactors started up in 2012, while six were shut down and in 2013 up to 1 July, only one started up, while four shutdown decisions—all in the U.S.—were taken in the first half of 2013. Three of those four units faced costly repairs, but one, Kewaunee, Wisconsin, was running well and had received a license renewal just two years ago to operate up to a total of 60 years; it simply became uneconomic to run. As of 1 July 2013, there were only two reactors operating in Japan and how many others will receive permission to restart and over what timeframe remains highly uncertain. • Newcomer Program Delays. Engagement in nuclear programs has been delayed by most of the potential newcomer countries, including Bangladesh, Belarus, Jordan, Lithuania, Poland, Saudi Arabia and Vietnam. • Construction Cancellation. In Russia, one reactor, which had just started construction in 2012 (Baltic-1), was abandoned in May 2013. • Construction Starts. In 2012, construction began on six reactors and on three so far in 2013, including on two units in the U.S. for the first time in three and a half decades. Those two units have been offered over $8 billion in federal loan guarantees and other subsidies whose total rivals their construction cost, and special laws have transferred financial risks to the taxpayers and customers. • Certification Delays. The certification of new reactor designs has continued to be delayed, in the U.S. certification of the Franco-German-designed EPR was pushed back again, this time to 2015. Only the Westinghouse AP1000 has received full generic design approval in the U.S.
• Construction Start Delays. In various countries firmly planned construction starts were delayed, most notably in China, where for almost two years, between December 2010 and November 2012, not a single new reactor building site was opened. Furthermore, in the first half of 2013 it did not start any further constructions. • Capital Cost Increases. Construction costs are a key determinant of the final nuclear electricity generating costs and many projects are significantly over budget. Cost estimates have increased in the past decade from $1,000 to $7,000 per kW installed. The U.S. Vogtle project, now officially under construction, is built by the same firm whose two previous reactors at that site were originally budgeted at $660 millionand were later estimated to have cost $9 billion. • State Aid. The U.K. model of Contract for Difference (CFD), a kind of feed-in tariff agreement for nuclear electricity that is aimed at providing a subsidy scheme for new-build, in the view of many observers, is likely to violate current EU competition rules. • Operating Cost Increases. In some countries, especially the U.S. illustrated by the Kewaunee case, historically low inflation-adjusted operating costs—especially for major repairs—have escalated so rapidly that the average reactor’s operating costs is barely below the normal band of wholesale power prices. • Post-Fukushima Costs. Additional costs arising from upgrading and backfitting measures following the lessons of the Fukushima crisis are only beginning to surface. They are likely to have substantial impact on investment as well as operational costs. • Income and Debt. Nine out of 14 major utilities assessed saw their earnings decline over the past five years while 13 constantly increased their debt level. • Credit Rating. Over the past five years, 15 assessed nuclear utilities, 10 were downgraded by credit rating agency Standard and Poor’s, four companies remained stable, while only one was upgraded over the same period. Rating agencies consider nuclear investment risky and the abandoning of nuclear projects explicitly “credit positive”. • Share Value. The share value of the world’s largest nuclear operator, French state utility EDF, went down by 85 percent over the past five years, while the share price of the world’s largest nuclear builder, French state company AREVA, dropped by up to 88 percent. This assessment includes analyses of on-site and off-site challenges that have arisen from the 3/11 disaster. To what extent the disaster was triggered by the earthquake or the tsunami or by both in combination cannot yet be conclusively elucidated. Source: Asahi Shimbun, 30 June 2013. • On-site Challenges. Radiation readings inside the reactor buildings of units 1—3 vary between 5 mSv/h and 73 Sv/h, which makes human intervention almost impossible. Massive amounts of water, about 360 tons per day, are still pumped into the destroyed reactors via makeshift vinyl tubes that frequently leak. This water, together with a similar additional amount of groundwater, seeps into the basements of the reactor buildings, some of it decontaminated to some degree and re-injected. The amount of radioactive water that cannot be re-used is constantly increasing and has reached 380,000 tons in precarious storage of which 90,000 tons in the basements. It is estimated that 27 times the amount of cesium-137 released into the air in the first three weeks or more than 2.5 times the total amount released at the Chernobyl accident is contained in this water. • Off-site Challenges. More than 150,000 people remain in forced evacuation. About 130,000 compensation claims have been filed. A total of 101 municipalities in 8 prefectures were designated as a “Scheduled Contamination Survey Zone”, where annual doses between 1 and 20 mSv are predicted and local authorities are responsible for decontamination work. In addition, the central government is in charge of decontamination efforts in 11 municipalities in Fukushima Prefecture covering 235 km2, where annual doses exceed 20 mSv. Less than 5 percent of the surface has seen any decontamination efforts. The worst-case scenario, as depicted by the Chairman of the Japan Atomic Energy Commission in the middle of the crisis in March 2011, remains the collapse of the spent fuel pool of unit 4 and a subsequent fuel fire, potentially requiring evacuation of up to 10 million people in a 250 km radius of Fukushima, including a significant part of Tokyo. In spite of a slight decrease in global investment in 2012, partly reflecting rapidly falling equipment prices, renewable energy development continues its rapid expansion in both, capacity and generation. China, Germany and Japan, three of the world’s four largest economies, as well as India, now generate more power from renewables than from nuclear power. • Investment. Global investment in renewable energy totaled $268 billion in 2012, down from $300 billion the previous year but still five times the 2004 amount. China increased spending by 20 percent to $65 billion and was by far the largest investor. While some big investors (U.S., Germany, Italy) reduced their spending considerably, some smaller players boosted their investments and reached the top ten, including South Africa, which skyrocketed spending by a factor of 200 to reach $5.5 billion, and Japan, which added 75 percent to reach $16 billion. • Installed Capacity. Globally, since 2000, the annual growth rates for onshore wind power have averaged 27 percent and for solar photovoltaics 42 percent. This has resulted in 2012 in 45 GW of wind and 32 GW of solar being installed, compared to a net addition of 1.2 GW of nuclear. China has a total of 75 GW of operating wind power capacity, roughly doubled in each of the past five years. • Electricity Generation. In 2012 wind produced almost 500 TWh and solar power about 100 TWh more than in 2000, while nuclear power generated 100 TWh less. For the first time in 2012 China and India generated more power from wind than from nuclear plants, while in China solar electricity generation grew by 400 percent in one year.